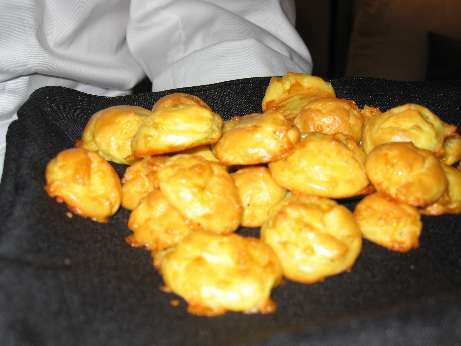 Gougeres (or Cheese Puffs) are a nice way to start a party, especially as guests arrive and imbibe their first drinks. Our first drinks this year were Kir Royale (Champagne with Cassis Liquor added), whicih always makes for a festive beginning. Champagne goes well with salty or oily foods, both of which happen to be the case for cheese puffs. Cheese Puffs are one of those things that you can find recipes for just about anyplace. I did a quick google and came up with this one which I used as the basis. I think it's a bit high on butter and low on flour and ended up adding another 1/4 C of flour to get the right dough prior to the eggs. - you can easily prepare the pate a choux up to an hour in advance with no ill effect (this lets you wash up before the party). Put into the piping bag, but don't pipe or bake until the last minute. A large glass or pitcher can be used to keep the piping bag under control until you are ready to use it. - for complex parties, it is often less cleanup work to use a zip-top bag as your piping bag either with or without a tip. For very thick pate a choux, you may (like we did) "blow out" the plastic bag and need to re-seat it within another before continuing. You can also buy disposable plastic piping bags, which will not generally suffer from this problem. - use parchment paper for baking. This ensures quick release, and very little cleanup.